Mosaics in Gardens, a perfect partnership: Drostle mosaics at the Chelsea Flower Show. Although still not in common use in gardens, mosaics offer many benefits to the garden designer. They offer the opportunity of introducing year round colour and creating a hardscape surface that is unique to the individual client. Here we look at garden mosaics and in particular Drostle mosaics at the Chelsea Flower Show. Gary’s most popular garden mosaic design has been his mosaic fishponds. These beautiful trompe l’oeil floor mosaics are a great focal talking point for any garden, they bring colour, focus and humour to a pavement and offer some of the harmony of a water feature without any of the maintenance issues. 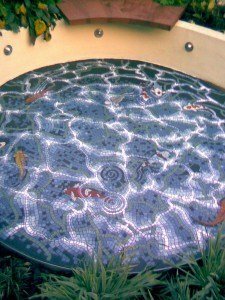 Garden mosaics can be made as wall, floor or free standing sculptural features offering a wide range of design solutions for large or small gardens. Every mosaic artwork brings unique colour, texture and identity to your garden and helps make your space uniquely your own. 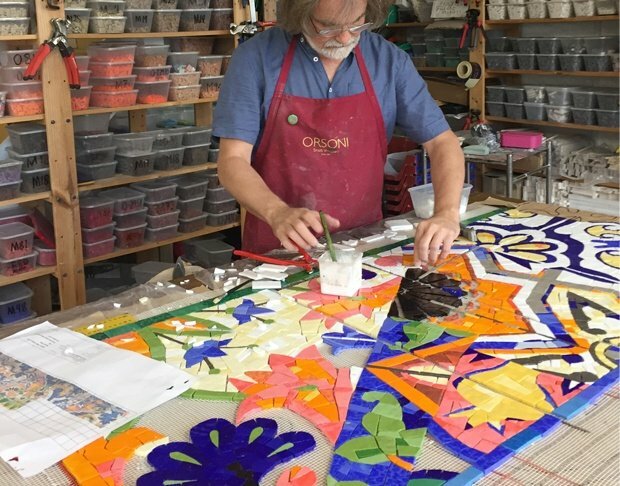 Gary’s first opportunity to show the creative possibilities of mosaics in gardens came in 2007 when Leeds City Council approached him to create a focal centre-piece for their Roman themed garden. The challenge with this mosaic was to create a mosaic that looked ‘broken’ and ‘disrupted’ but which had the robustness and strength of a new mosaic. 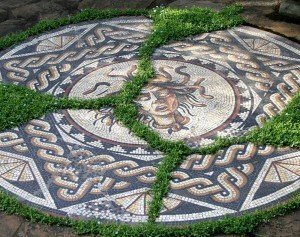 Gary designed and made this Medusa poundal mosaic which features cracks, dislodged and discoloured tesserae and plants growing between the mosaic. Usually these attributes would signal the complete breakdown of a mosaic but Gary cleverly used four separate steel trays to create the crack effects whilst retaining the mosaic’s structural integrity. This year Gary’s mosaic work again formed a focal feature in the new garden by renowned designer Sarah Eberle. Sarah’s design for the Viking Cruises Garden of Inspiration was inspired by the City of Barcelona, this artisan garden included a curved mosaic wall inspired by the famous walls of Pac Güell by Antoni Gaudî. 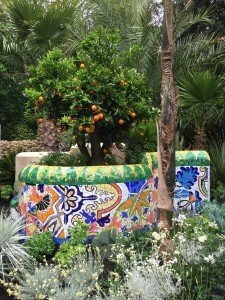 As well as the main mosaic feature wall and mosaic bench the garden featured another mosaic topped wall and mosaic detail in the water feature channel.